It has been hot here. Very hot. Hot as balls. Until we get power and water up at our cabbage – a process we are working on that I will write about later – we are staying in a spare room at my in-law’s house (for free, which I am incredibly grateful for.) By we, I mean Mindy, myself, our cat, and about ¼ of our stuff, mostly clothes and a couch, all crammed into a bedroom which already had some stuff in it. 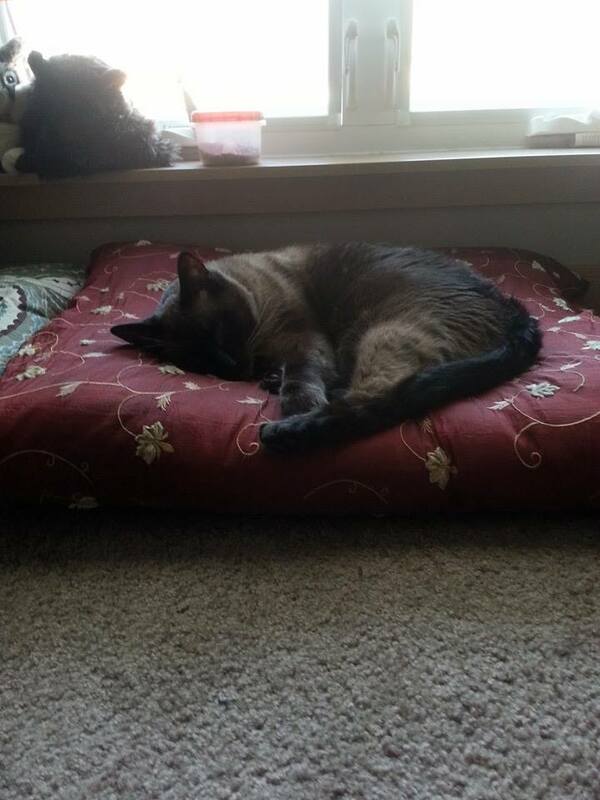 I feel awful for the poor cat; in addition to not really having a chance to get out and stretch his legs, he wears a fur coat that he can never take off, and like I said, it’s been hot. Growing up in the Pacific Northwest, on the western side of the state, I am not particularly used to hot summers. No one has air conditioning because a typical summer day in the greater Seattle region is about 70F and overcast. If you’re hot, you open a window. Our four years in Yakima was my first experience with living anyplace that can easily reach 90F+, but even the creaky old house we lived in had A/C. I’ve never been in the situation of living someplace hot and not having A/C before. After researching my options, I finally decided to go ahead and make an evaporative cooler (AKA “swamp cooler”) for our room, if for no other reason than to try to cool down our frustrated feline. Pinterest has seemingly endless tutorials on how to make such a thing – enough that choosing your design can be a little overwhelming. I ended up going with an old bucket, lining it with Styrofoam, and drilling four holes through both layers. Then I stuck about two inches of PVC pipe through the holes. At the top of the bucket, I made a 9-inch wide hole. Finally, I filled the bucket with ice, stuck a fan on top of the bucket, and turned it on. That being said, it’s been a really good learning experience for me, in that I know what I’d do differently next time. 1. Choose function over form. I had been torn between the bucket cooler and the ice chest cooler, and ultimately went with the bucket cooler because I thought it looked a little like a Dalek. This is only amusing for the first five minutes, and even less when you’re trying to cool a room off in 100F+ heat. 2. Prioritize efficiency. 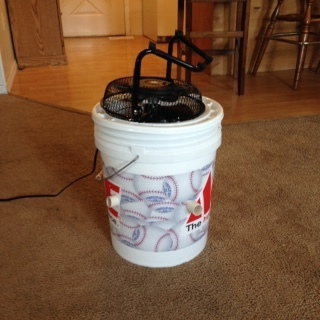 A bucket cooler is limited by its capacity to store ice, and thus cool the room. It also is not the most efficient design, due to its little holes to move humid, cool air through. An ice chest cooler utilizes a larger vent and depending on the chest, will have more storage capacity. Unfortunately, it doesn’t look like a retro sci-fi villain. 3. Don’t skimp on the fan. I got a cheap little 9-inch desk fan, which barely pushes air around. Something stronger would be much more effective. 4. Rotate your cold source. One of the benefits to the bucket cooler is that it perfectly accommodates two smaller buckets full of ice. The problem is that I only have one small bucket. So what ends up happening (at least until I get the second bucket) is that the room will be cool for awhile, until the ice melts and I have to set it in the freezer again. With two or more small buckets I could avoid the needless cold/warm cycle and keep the room a constant temperature. I’m going to play with some different ideas – maybe adding some dry ice to keep the coolant cold longer, maybe scrapping the bucket cooler altogether and building a different cooler. But I’ve learned a lot and the cat seems happier, so we’ve got that going for us. Poor Nicky! Can’t get out and roam and too hot to boot. I congratulate you on thinking about this, I think I would have just tried to sit in the shade, with my feet in cold water. (as my relatives did in India) That reminds me, eat spicey food, it cools the body down. I do not know if the same effect would happen to felines, he would most likely try licking it up. I hope that with the calendar changing, and marching on, that this problem will evaporate much like the ice, but try and keep a good record of this, as summer rolls around every year.